To celebrate 'Adopt a Senior Dog Month' in November, The Grey Muzzle Organization and Doug Ratner and The Watchmen are making a senior dog music video to help promote awareness and more adoption of senior dogs. 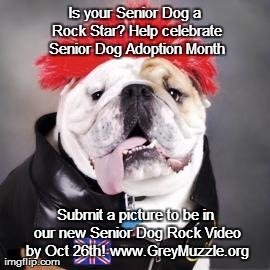 To have your adopted senior dog included in the music video, please email a picture of your senior dog, the dog's name and the shelter or rescue you adopted your dog no later than October 26th. We will post and share the video on November 1st. Note: By submitting a photo, you give permission for the photo to be used in this music video and all promotional materials.